The puppies have been born! (When I say puppies, I don’t mean that we are getting more than one, rather the dog gave birth to 6 puppies.) We got the email yesterday from the breeder. So, this weekend we go to see the newborn puppies. I don’t even think their little eyes will be open yet. I really wanted the girls to see the tiny babies…not just an 8 week old baby that we will bring home with us. Yikes! That means we have 8 weeks until a puppy will be in our home! 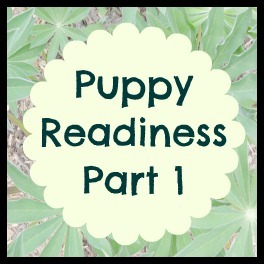 Time to jump into Puppy Readiness Part 1 – making the list of things to do to get ready for the arrival of our puppy. So, as you can see we have a lot of work to do over the next 8 weeks. We’ll be starting with preparing the dog’s space. The dog crate will be placed in our basement landing. The crate will go where the doll house is…which means we need a new home for the doll house. Fortunately, we have left over paint from my daughter’s bedroom makeover that we’ll be putting to use in this space. A nice cheery green for our little guy. Behind the curtain is our laundry room, we’ll need to close off that doorway as well. See, there is a ton of work to be done! This is where you come in…What’s your best tip for bringing home a puppy? What items were your favourite? What things did you buy and never use? Please leave your puppy related thoughts here or on my Facebook page. I’ll collect your thoughts and suggestions in a future post. I get the feeling that it might just take a village to raise a puppy. Fun! We have had our pup Ollie for over 2months now, & are getting another this weekend. Crates are of course, a must, & baby gates to keep them out of certain areas until housebroken. A good pure food (Life Abundance is good) & some toys. But you’ll have to see what they like. We have several but so far he only likes stuffed animals LOL. We will find out what the new one likes soon! A bed is probably not necessary to start, until at least somewhat trustworthy in the house. I use towels in the crates to make him comfy & bonus is they’re washable ;-). Enjoy! !